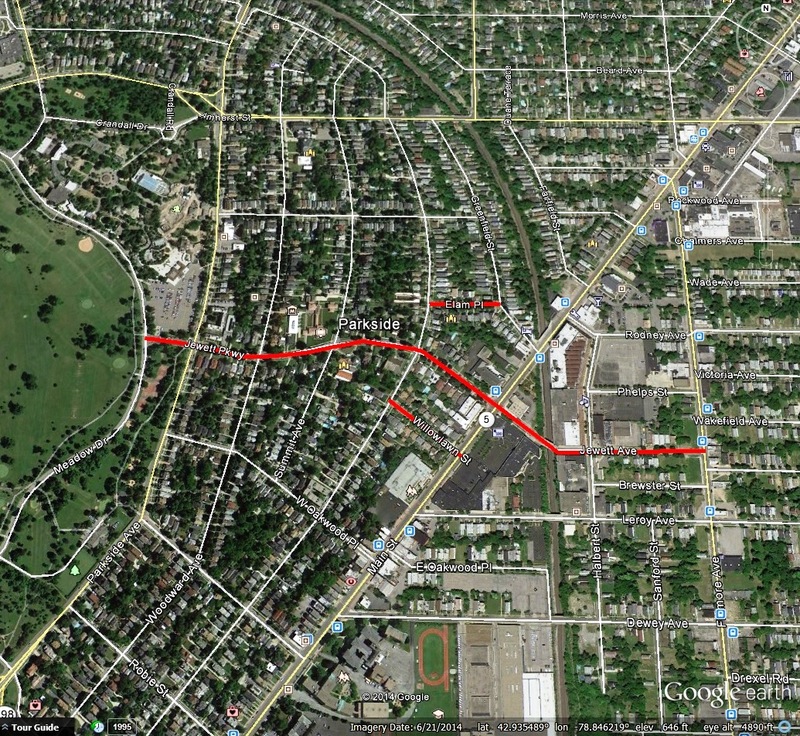 Jewett Parkway, Jewett Avenue, Elam Place and Willowlawn Street are streets in the Parkside Neighborhood of Buffalo (Jewett Avenue is located on the East Side of Main Street, just outside the Parkside Neighborhood). The streets are all named after Elam Jewett. Mr. Jewett started his career with a $35 loan from his father, turning that $35 into a great amount of wealth and prominence. Elam Richardson Jewett was born in New Haven, Vermont in 1810. His father was a farmer and was in the wool and cloth-dressing business. At age seven, Elam began to work on the farm, attending school only during the coldest months of the year when no farm work was necessary. At age 13, Elam quit school and decided to learn a trade. He began as an apprentice to a publisher in Middlebury, Vermont, to learn printing. At age 20, Mr. Jewett was a “first class printer”. He decided to enter Montpelier Academy after completing his apprenticeship, because he knew the value of education in his field. He only stayed at the Academy two months. He then got a job with the publisher of the Vermont State Journal and the Middlebury Free Press. In 1838, Mr. Jewett decided to take his chances out west. With $35 borrowed from his father, he toured New York State and Ohio. He decided to open a stationery and book store in Ohio City, across the river from Cleveland. He quickly learned that Ohio City was suffering from the panic of 1837, and was not a good place for a business. While planning to leave Ohio, he stopped in the office of a Cleveland newspaper, where he noticed an advertisement for the sale of the Buffalo Daily Journal, owned by the late Samuel Wilkeson. 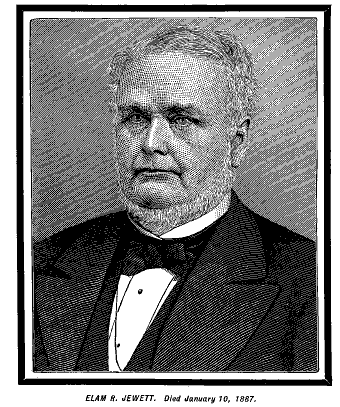 Mr. Jewett came to Buffalo and arranged to buy and publish the newspaper. At the time, its circulation was 600, which was large for its time. The Daily Journal later merged with the Buffalo Commercial Advertiser. Mr. Jewett remained in charge of the paper. Mr. Jewett was known for publishing articles that did not side-step around sensitive opinions. In 1847, Mr. Jewett wrote an article that upset a Polish midshipman of the U.S. Navy. The man met Mr. Jewett in his office, drew a pistol and fired two shots at him. The shots were low, and the bullets lodged in Mr. Jewett’s leather wallet, saving him from death. In 1850, Mr. Jewett became manager of the New York State Register of Albany. He managed his time between Buffalo and Albany while also establishing the printing and engraving firm that later became Matthews-Northrup Company. The company’s printing and engraving was deemed best in the country and the U.S. Patent Office in Washington DC contracted with the firm for all engraved reproductions of inventions. During the 1850s, Mr. Jewett traveled through Europe with Millard Fillmore. While in Europe, they were entertained by English nobility and Pope Pius IX. In 1857, Mr. Jewett established a large envelope factory in Buffalo. In 1862, he sold his newspaper, and two years later he retired from all business activities. His nephew William Phelps Northrup took over at Matthews Northrup Company. Mr. Jewett retired in 1864 and bought 400 acres of the Chapin farm. He called his estate Willow Lawn. The property was located on the west side of Main Street from around Amherst Street to Leroy Avenue, stretching back to Delaware Avenue. Approximately 200 acres of the farm are now part of the meadow in Delaware Park. The land had been first settled by Daniel Chapin, who built a log cabin and developed a farm there in 1807. During the War of 1812, a company of American Soldiers were stationed there. When the British burned Buffalo, many of those men lost their lives defending that position. 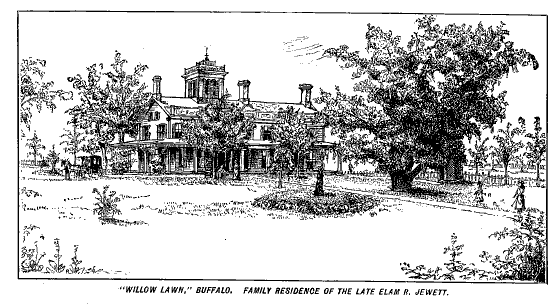 Willow Lawn took its name from the large willow trees growing on the property. Two of these willows marked the location of the buried soldiers in the meadow. Mr. Jewett married Caroline Wheeler of his hometown in 1838. None of their children lived long enough to enjoy Willow Lawn. The mansion was located at 2364 Main Street and was considered to be one of the most beautiful of its day. The property was described as a “model farm demonstrating to what perfection a country residence and farm can be”. The first tomatoes raised in Buffalo were grown in Mr. Jewett’s gardens. They were called “love apples” and were only used for decoration at the time, because tomatoes were believed to be poisonous. In 1870, Mr. Jewett received two deer which he kept in a paddock in the meadow. Some consider this the start of what eventually became the Buffalo Zoo in Delaware Park. In 1885, Mr. Jewett started the Parkside Land Improvement Company along with Washington Russell III and Dr. J. White. These three men owned most of the land in the Parkside neighborhood, which had been laid out by Frederick Law Olmsted. The three men parceled off the land and sold the lots for development purposes. Mr. Jewett donated a parcel from his estate, along with $10,000, to build the Church of the Good Shepherd, on Jewett Parkway. Another Jewett, Sherman Skinner Jewett, was influential in the development of the Olmsted Parks, helping to bring Olmsted to Buffalo to tour possible sites. However, Sherman Jewett is not related to Elam Jewett. 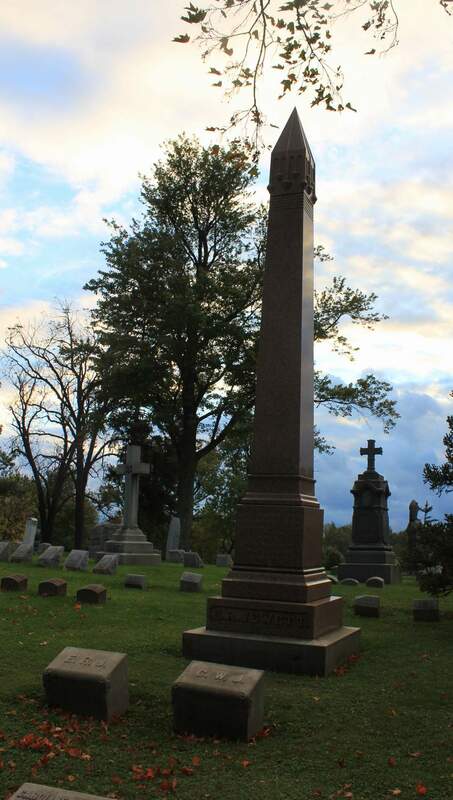 Elam R. Jewett died in 1887 and is buried in Forest Lawn along with his wife. Willow Lawn runs through what used to be the gardens of the Jewett farm. The Commercial Advertiser ceased operations in 1890. 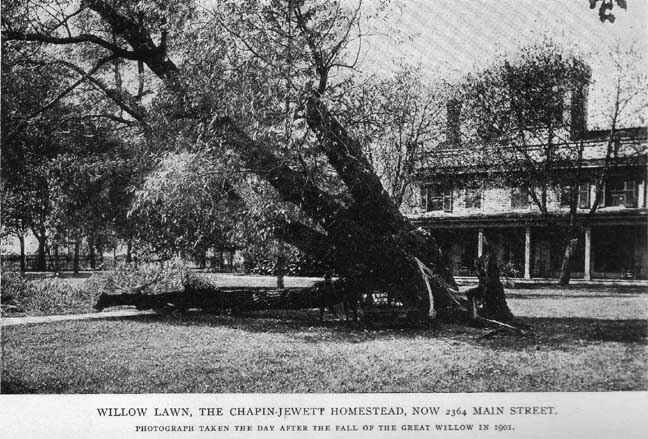 The willow tree that Mr. Jewett loved dearly only survived him by 14 years before falling during a gale storm in 1901. Read about other streets in the Street Index. “Four Streets Remind Buffalo of Elam Jewett, Publisher”. Courier Express June 22 1941, sec 6 p 3. Smith, Henry Perry. History of the City of Buffalo and Erie County. D. Mason & Co Publishers: Syracuse, NY: 1884. Pictorial Year-Book and Calendar for 1888. Buffalo Express. Larned, Josephus Nelson. A History of Buffalo: Delineating the Evolution of the City. The Progress of the Empire State Company. New York: 1911.